1. 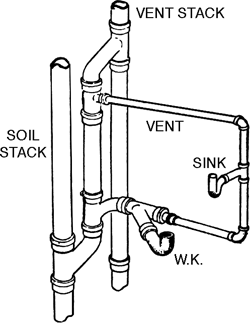 A pipe connecting upward from a soil stack or waste stack to a vent stack for the purpose of preventing pressure changes in the stack. 2. 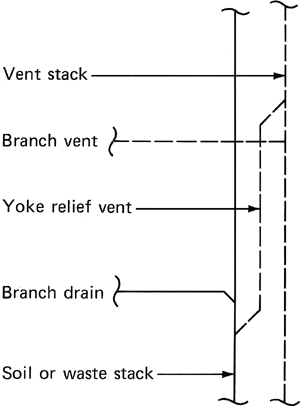 A vertical or 45° relief vent of the continuous-waste-and-vent type formed by the extension of an upright wye branch or 45° wye branch inlet of the horizontal branch to the stack; becomes a dual yoke vent when two horizontal branches are thus vented by the same relief vent. 3. A vent connected to a soil or waste stack that continues upward to the connection with the vent stack for the purpose of reducing pressure changes in the stack. Waterproof storm vents allow for the active circulation of air even in the wettest conditions, with side and front and back yoke vents creating a chimney effect that allows cool air in and humid air to escape.